For many southerners, Ambrosia is a traditional Christmas dish, and I am no exception. 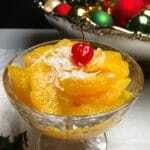 I actually can’t imagine the holidays without ambrosia, and if you have never tasted it, you are in for a treat. Old Fashioned Southern Ambrosia is also a perfect side dish for a Mother’s Day or Father’s Day breakfast or brunch! Nectar of the Gods is a great description of this popular citrusy fruit salad. 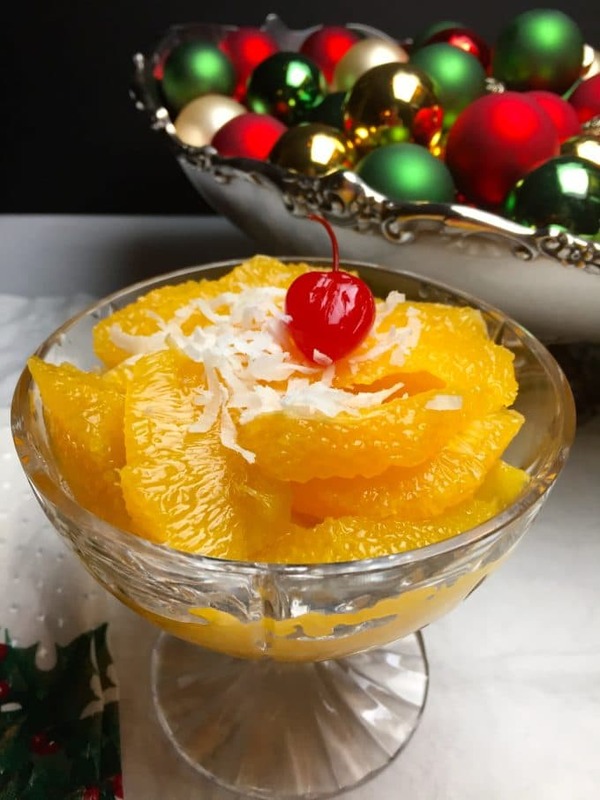 In the south, there are probably as many variations of ambrosia as they are elves, but my favorite and the recipe I am sharing today is simply fresh navel oranges and their juice, and a touch of powdered sugar, with just a smidgen of coconut on top. Yes, I know many of you also add grapefruit or other citrus, pecans, and pineapple and some of you go all the way with the addition of whipped cream and marshmallows. 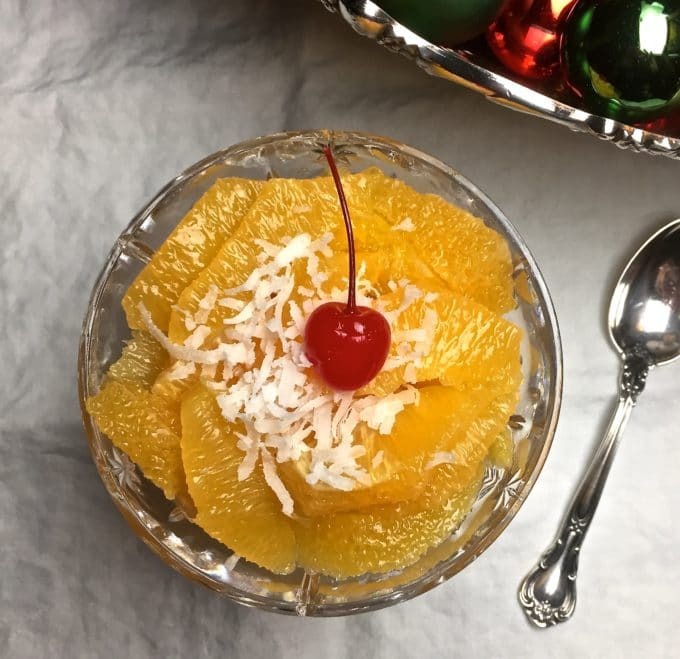 I think I have tasted and enjoyed all of the combinations for this tasty fruit salad, but this simple dish is what I keep coming back to year after year. Speaking of traditions, I usually serve Old Fashioned Southern Ambrosia with my other make-ahead favorites, Sausage Bread, and Make Ahead Caramel Soaked French Toast for our breakfast on Christmas morning and this decadent breakfast is something we all look forward to! Oh, and Old Fashioned Southern Ambrosia isn’t just for Christmas! It’s perfect for Mother’s Day, Father’s Day, Easter, or really any day you want something special! Need even more breakfast or brunch ideas, check out my roundup of easy and delicious other recipes: 32 Mother’s Day Breakfast and Brunch Recipes! 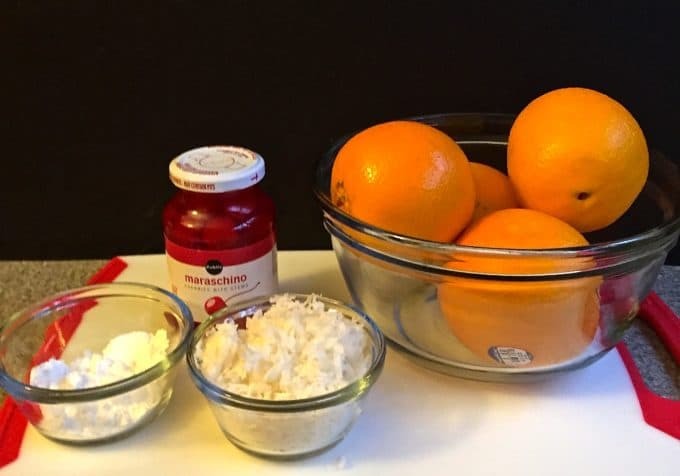 As I told you, the ingredients are simple: navel oranges and their juice, powdered sugar, sweetened coconut and maraschino cherries for garnish. When you are ready to make this delicious and healthy dish, gather your ingredients and begin by peeling the oranges with a sharp paring knife. Make sure to remove all of the white pith. Next section the oranges, by placing the knife along the inside of the membrane of the orange for each section. Run the knife to the center of the orange and pop out the orange section. When you are sectioning the oranges, be sure to do this over a bowl to catch all of the juice. Place the orange sections in the bowl with the juice and mix in the powdered sugar. Place in a serving dish and top with the coconut and if desired a Maraschino cherry. That’s it! If making ahead, cover and refrigerate until you are ready to serve it. For many southerners, Ambrosia is a traditional Christmas dish and most can’t imagine the holidays without it. It's also perfect for Mother's Day and Father's Day! Peel the oranges with a sharp paring knife. Make sure to remove all of the white pith. Next section the oranges, by placing the knife along the inside of the membrane of the orange for each section. 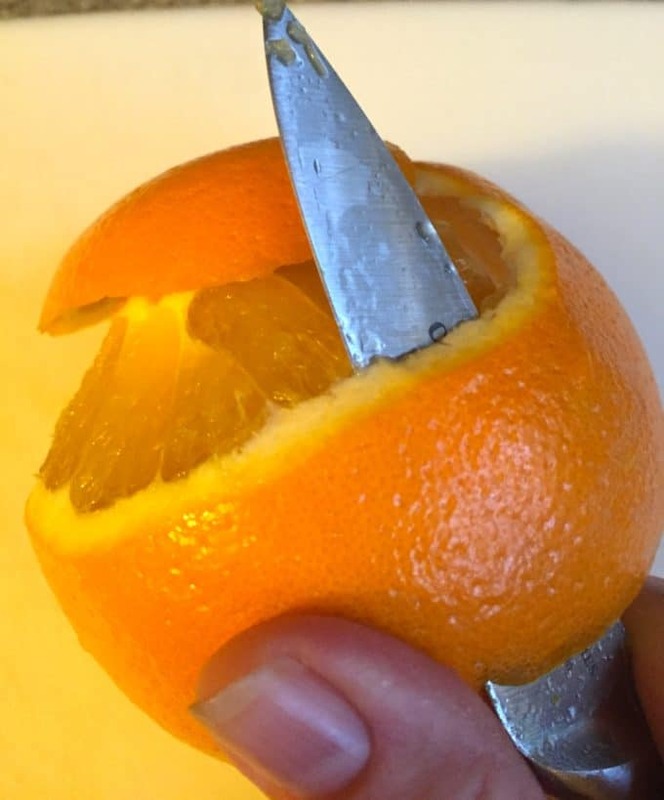 Run the knife to the center of the orange and pop out the orange section. 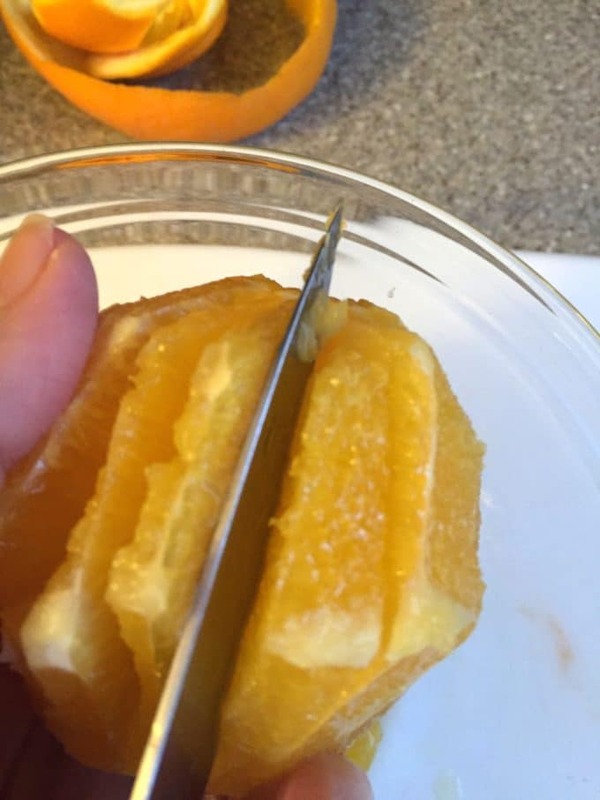 When you are sectioning the oranges, be sure to do this over a bowl to catch all of the juice. Place the orange sections in the bowl with the juice from the oranges and mix in the powdered sugar. Place in a serving dish and top with the coconut and if desired a Maraschino cherry.